The Aero BLIZZARD™ SUDS BLASTER is a powerful weapon against dirt and grime when connected to a pressure washer (sold separately). Custom tuned to AERO SUDS, the AERO BLIZZARD™ SUDS BLASTER delivers a dense layer of foam, lifting dirt and grime away from the paint so it can easily be rinsed off. Just add 2 to 3 ounces of AERO SUDS to the 1-liter carafe, fill with water, connect to a pressure washer and blast off with AERO BLIZZARD™ SUDS BLASTER. 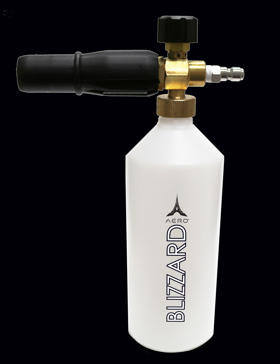 - Fully adjustable foam density and foam spray pattern. - Requires as little as 870 psi Pressure washer. - 28-410 Threaded fitting, allows replacement with a direct fit AERO SUDS bottle.